The APA will be making a nation-wide change to what was originally known as the Top Gun Program. From the Spring Session 2017 and going forward it will now be called the MVP Program. Using regular session data (excluding playoffs), MVP qualified players will be determined by using their Points Available Percentage (PA) and a minimum of 6 matches played. 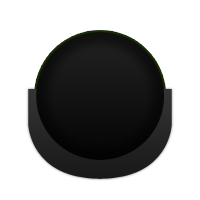 In every 8-Ball match, a player has 3 point available to win. If a player played 10 matches, they had 30 points available to win. The player won 43% of the points available “PA” to them during the session. In every 9-Ball match, a player has 20 points available to win. If a player played 10 matches, they had 200 points available to win. The player won 81% of the points available “PA” to them during the session. To get on the MVP list you will need a minimum of 6 matches played. The list is League wide for each skill level. The first place finisher at the end of each session for each skill level will get a plaque and a patch, if there is a tie each player will get a plaque and a patch. The Top 8 in each skill level are invited to MVP tournament that will be held prior to the TriCups for that session. Any active player can show up to fill in the board if there are spaces available. Empty spaces will be filled by your place on the MVP board highest to lowest. 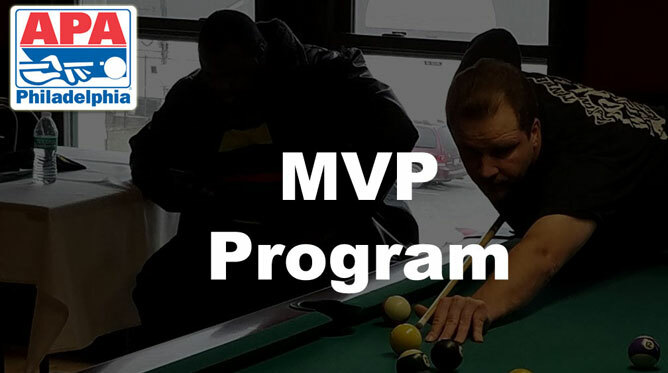 The MVP Tournament will be run as a free Singles Board and all winners will qualify for the Singles Regional Tournament for a chance to win a trip to Las Vegas to compete in the National Singles Tournament. First Place Division MVP winners will receive a Certificate. The MVP list will be posted here after week 6 of each session and will be updated each Tuesday till the end of the session.